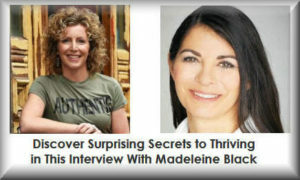 Emma’s interview with Madeleine Black teaches us more about thriving in her series of examining #50Thrivers. Madeleine faces the horrors of being gang raped when she was 13-years old. She shares how she learned to forgive the men who raped her and herself. She learned how to reclaim her self-love. She defines thriving as first being frozen and then starting to de-frost. She’s more alive and spontaneous. Click here to listen to this 6-minute video.